This medium pink crape myrtle is a strong rebloomer. Maturing in the 13 to 20 foot height range, this tree crape myrtle is an excellent landscape tree. The gray-brown bark provides winter interest that maybe as pretty as the lovely pink summer flowers. 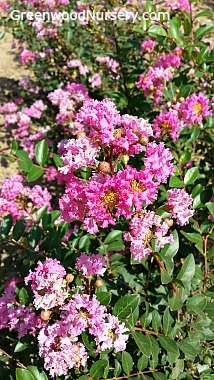 Sioux Crape Myrtle is a field grown plant that is dug and shipped bare root.